We manufacture high precision fittings for Thermal Sensors and Instrumentation Industry. 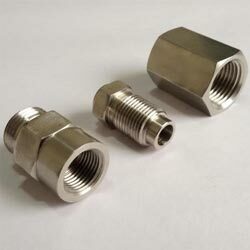 We manufacture these fittings as per customer requirements wide range of material e.g. Stainless Steel Grades SS316 & SS304, High Grade Brass, Mild Steel and Carbon Steels. All the threads are manufactured to highest standards using Thread Ring Gauges. Pitch Diameter is also monitored closely using Pitch Micrometer.